As with many other people I because aware of this novel because of its film release (due later this year), I’s heard good things about the novel and the film looked brilliant. We’re guided through the novel by Mia herself as she struggles to watch the rest of the day unfold. All she can do is watch and listen. Her family, friends and boyfriend are all willing her to come back and it’s up to Mia to decide if that’s enough. Although I like the idea, the novel didn’t particularly stand out to me. The novel is fairly short and sways between the present and past and gives us a good insight into Mia’s life before the accident. I found it hard to connect to the story, of course it made me sad but I didn’t feel a deep rooted connection to Mia or the characters around her. That said, I did feel an incredible connection in relation to how she felt about her music and the prospect of being a musician and this added to the sense of tragedy. If anything I would have loved more insight into her love of music and her hopes and dreams, although maybe this was intentional. Forman has ventured into a question that few of us will even consider answering, if I could chose would I live or die? For many of us we would instantly say I’d live, but would we? This is not the first novel of its kind, however, it is the first for young adult readers, it makes them think. I makes the reader consider a life without their loved ones and the choices and sacrifices that are made every day. I wouldn’t say that the novel is morbid in that respect but it deals with death in quite a straight forward way, for Mia it appears to be more of an escape. It also raises the question of life after, we have no idea how Mia will be affected by her injurys if she decides to survive. Will she play Cello again? Will her dream of going to Julliard be snatched away from her as her parents were? Is her younger brother Teddy, who she adores, still alive? As I said it is a novel full of questions and what if situations. I give this novel 3 stars ***. I liked the idea and found Mia to be a nice character but failed to interact with her as a person. I also found that I was hungry for more at the end of the novel and felt that it could have had a better ending or more to it maybe? 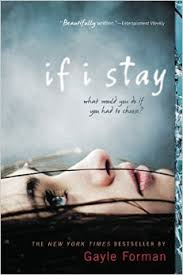 If you’re looking for a shorter read that raises questions then If I Stay may well be for you.